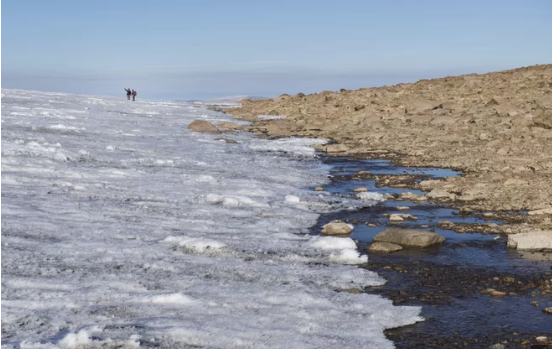 The retreat of Arctic glaciers on Baffin Island is exposing landscapes that haven’t seen the sun for nearly 120,000 years. These rocky vistas have very likely been covered in ice since the Eemian, a period in which average temperatures were up to 3.6 degrees Fahrenheit (2 degrees Celsius) warmer than present, and sea levels up to 30 feet (9 meters) higher. The island is ringed with dramatic fjords, but its interior is dominated by high-elevation, relatively flat, tundra plains. These tundra plains are covered with thin ice caps. Because the landscape is so flat, the ice caps don’t flow and slide like typical glaciers. Instead, they simply sit on the underlying rock and soil, preserving everything beneath them like the glass of a museum case. What’s preserved includes tiny Arctic plants and mosses that were last alive when the ice enveloped the land. 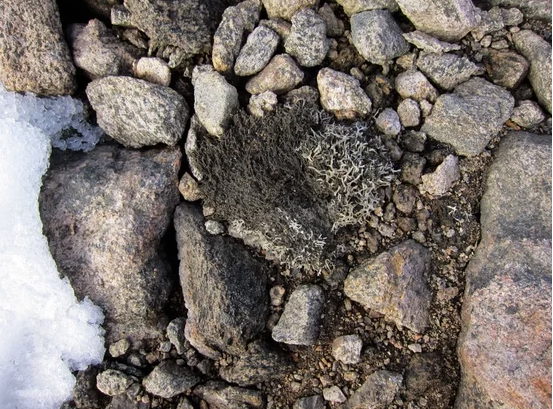 As the ice melts, it exposes this ancient, delicate vegetation. Wind and water destroy the long-lost plants within months, but if researchers can get to them first, they can use radiocarbon dating to determine the age of the vegetation. The samples were at least as old as the oldest age that radiocarbon dating can detect: 40,000 years. That’s a direct indication that the plants had been under ice for at least that long. At least 70,000 people marched on January 27 in Brussels, braving the cold and rain to urge politicians to uphold their promises on countering climate change. Thousands gathered in Paris and across France on Sunday to denounce political inaction on battling climate change. More than 100 demonstrations were planned across France for a weekend of action on the environment. Organisers called on people to come together to discuss practical ideas on how to advance an agenda that would halt or at least slow global warming. Hundreds of people battled heavy rain and winds in Paris to attend a protest at Place de la République that included representatives from NGOs, scientists and activists as well as the general public. Throughout the afternoon moderators will run workshops exploring how to make the planet greener and how lawsuits can be an effective tool against climate change. More than 2 million people signed a petition in December to sue the French government for not doing enough to combat climate change, France’s most successful petition ever. In a pioneering move, a German government-appointed panel has recommended that Germany stop burning coal to generate electricity by 2038 at the latest, as part of efforts to curb climate change. Emergency services in Tasmania are battling 72 separate bushfires. Smoke from Tasmania’s numerous bushfires is being spotted as far away as New Zealand as parts of the state remain at threat from blazes up to 20,000 hectares in size. The greatest threat on Monday was posed by an “erratic” fire burning near Geeveston, southwest of Hobart, where about 400 people have evacuated their homes. 6.2 earthquake hits the Solomon Islands. 5.8 earthquake hits Kepulauan Kai, Indonesia. 5.7 earthquake hits the Santa Cruz Islands. In the Southern Hemisphere: Tropical cyclone (tc) 11s (Riley), located approximately 334 nm north-northeast of Learmonth, Australia, is tracking southwestward at 04 knots. Turkey – Heavy rains have caused floods in Turkey’s southern province of Antalya. Brazil – A mining dam collapsed in southeastern Brazil on Friday, Jan. 25. The dam flooded a nearby community, raising concerns of widespread contamination. Brazilian mining company Vale SA said in a statement that it didn’t yet have information on deaths or injuries at the dam in Minas Gerais state but said that tailings have reached the community of Vila Ferteco and an administrative office. Parts of the city were evacuated and local firefighters were rescuing people by helicopter and ground vehicles. Connecticut, USA – Rain, some of it heavy, arrived in the state on Thursday leading to flooding for some areas. A flash flood watch and flood warning were in effect for the entire state. Indonesia – The number of people killed after days of torrential rain triggered flash floods and landslides on Indonesia’s Sulawesi island has climbed to 59 with 25 others missing, a disaster official said Friday. 5.6 earthquake hits near the coast of central Peru. In the Southern Hemisphere: Tropical cyclone (tc) 11s (Riley), located approximately 398 nm northeast of Learmonth, Australia, is tracking westward at 06 knots. Indonesia – Floods and landslides in a central Indonesian province hit by torrential rains this week have killed 30 people and left more than two dozen missing, the national disaster agency said Thursday. Ten districts and cities in South Sulawesi province including the capital, Makassar, have been affected by flooding that began late Tuesday, forcing more than 3,000 people to flee their homes.S of the victims had been electrocuted while others were buried by landslides. Humanity might be running out of time to turn away from a path toward our utter annihilation — at least, according to the hypothetical Doomsday Clock. 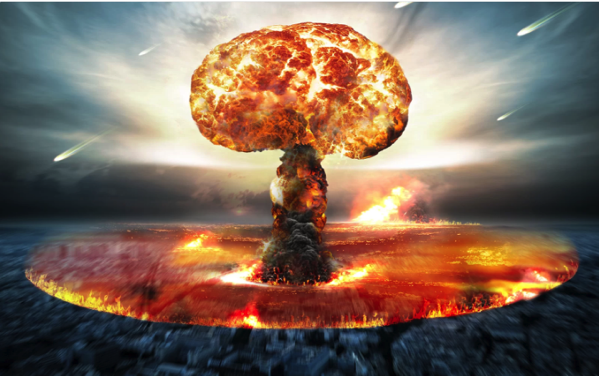 Experts with the Bulletin of the Atomic Scientists (BAS) updated the imaginary timepiece, which measures the proximity of humanity’s destruction based on the position of the clock’s hands relative to midnight — the hour of the impending apocalypse. Last year the Doomsday Clock’s hands were set at 2 minutes to midnight, the closest it had ever been to “doomsday.” And, citing similar risks of humanity’s destruction, BAS representatives announced today that the clock will remain at 2 minutes to midnight. But even though the clock’s hands haven’t moved, the proliferation of nuclear weapons and the relentless progress of climate change — aided by widespread misinformation and fake news — are still a cause for grave concern, BAS representatives declared at a press event. Temperatures in southern Australian neared 48 degrees on Thursday, shattering previous records as sizzling citizens received free beer to help weather heatwave of historic proportions. The Bureau of Meteorology reported temperatures of 47.9 Celsius (118 Fahrenheit) north of Adelaide, while inside the city temperatures reached 46.2 Celsius, a fraction above a record that had stood since 1939. Residents in a rural area of Brazil’s Minas Gerais state reported being alarmed after seeing spiders “raining” from the sky, which experts say was due to the region’s hot and humid weather. While it did appear as if the arachnids were falling from above, experts said they were actually hanging in a giant web to catch prey. Parawixia bistriata is a rare “social” spider that nests in a giant ball during the day in vegetation. It emerges at night to catch small insects and even birds in its nearly invisible but massive webs.